This came out as much more of a rant than I'd intended...sorry! I remember in college when I wanted to read something fun, but really, there was nothing for me--just stuff that was either aged too young, or was boring! I haven't read this one--I'll have to look for it next time I'm at chapters and see what you mean about the age-y ness. 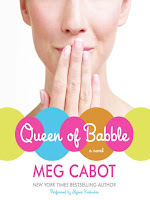 For what it's worth on Meg Cabot's website she considers the Queen of Babble series to be for adults - not teens. Really nice post! It hits everything on the head. Almost anything goes with YA these days. Yeah, that's what it seems for YA... anything goes... which is really fotunate, right? I'm so glad you commented on my post today, because it meant that I found your website. We have a lot of similar ideas. I agree with you whole hog on this age topic issue! There should be some sort of distinction between the "PG-13" and the ones more appropriate for the 18-30 range. I enjoy Meg Cabot and many of her stories are great for my 14 year old, but I don't want her reading Q of B yet or some of the more adult books she writes just yet. 12-18 is a huge range of maturity level. It would have been nice when I was in college to have a section of "fun" reads for me.